The area where the body was found. The victim had multiple stab wounds to the left side of her chest and her throat was partially slit. Police are yet to confirm the identity of the young woman who was found murdered near Herold’s Bay yesterday, July 5, reports George Herald. It is believed the woman, in her early/mid-20s, is from Thembalethu, and went for an interview at the George Airport yesterday. She apparently took a lift with a male acquaintance and two coloured men in a white Polo with a CBS registration number plate. The George Herald is in possession of a WhatsApp message believed to be from the victim to a friend, in which she asks that the friend urgently contact the police. She mentions the interview and that it went well, and says the men offered her a lift, indicating that they were going to Herold’s Bay to a girlfriend of one of the men. A fisherman discovered the woman’s body yesterday afternoon on the gravel road leading to Voëlklip. 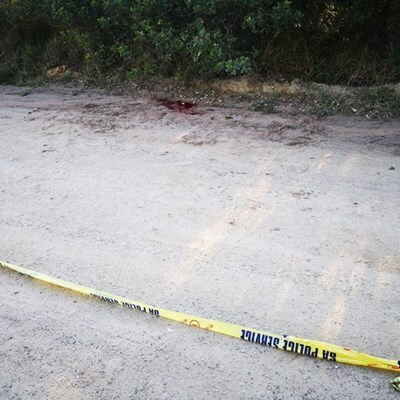 Captain Malcolm Pojie, the Southern Cape police spokesperson, said the victim had multiple stab wounds to the left side of her chest and her throat was partially slit. The police appeal to the public to come forward with information that can assist in the investigation. Contact Sergeant Lindeni Ndwenkuku at George police detectives on 044-803-4717.